Heat oven to 375°F. 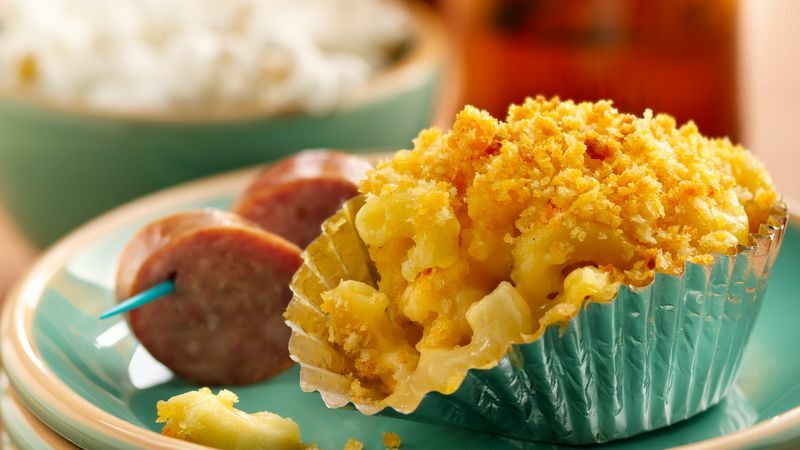 Place foil baking cup in each of 18 regular-size muffin cups. In small microwavable bowl, microwave 1 tablespoon of the butter uncovered on High 15 to 30 seconds or until melted. Stir in bread crumbs; set aside. Meanwhile, melt remaining 3 tablespoons butter in 4-quart saucepan over low heat. Stir in flour. Cook 1 minute, stirring with whisk. While continuing to stir, add milk and beer. Cook and stir 1 to 2 minutes or until thickened and smooth. Remove from heat; stir in cheeses, salt and pepper. Add cooked macaroni; stir well. Spoon about 1/4 cup macaroni into each cup. Top each with scant 1 tablespoon bread crumb mixture. Bake 25 to 30 minutes or until hot and topping is golden brown. Cool 5 minutes; remove from pan. Garnish with bratwurst or popcorn.